When you choose the 2017 Ford Super Duty, you get a truck that's serious about work. It comes loaded with features that help you tow and haul with the best of them, plus get through particularly rugged areas. 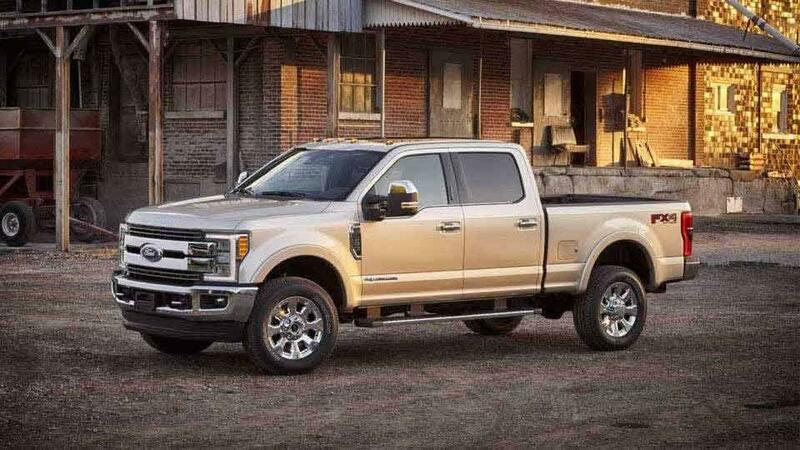 You can get many varieties of the Ford Super Duty, allowing shoppers to find the configuration and features that work best for them. More specifically, the Ford F-350 comes in five well-appointed models that make it easier to find one you'll love. Trust that the Ford F-350 will endure whatever you dish out. No other truck comes with a high-strength, military-grade, aluminum-alloy body. This innovation makes the pickup lighter and strong while resisting damage from dents and dings. You don't need to worry about red rust with this material, either. With the weight savings gained by the lighter body construction, Ford designed a completely new fully-boxed frame constructed out of 95 percent high-strength steel. It contains up to ten crossmembers, making it 24 times stiffer, seriously reducing the risk of twisting under heavy loads. Ford went even further, adding stronger axles. This means you can handle more weight with your Ford F-350 than before. With this benefit, owners can load up all kinds of gear in the bed, tow large trailers or add heavy accessories to the front end, like a snow plow, without worry. You get two choices for engines. The first is a 6.2-litre Flex-Fuel V-8, which runs on gasoline. It pumps out 385 horsepower and 430 lb.-ft. of torque, providing plenty of muscle for big jobs. Paired to this engine is a TorqShift G 6-speed automatic transmission. For the first time ever, you can add a Live-Drive Power Takeoff (PTO) Provision with Mobile Mode to this engine, something that previously was only available for diesel engines. Speaking of diesel, the other option is a mighty 6.7-litre Power Stroke V-8, which can run on B20. It pushes the envelope with a peak 440 horsepower and incredible 925 lb.-ft. of torque. One of the many secrets Ford used to squeeze so much power of the engine is the inverse-flow layout. The turbo sits between the two cylinder heads, with the exhaust manifold located nearby. Like with the gasoline option, this engine sends power to the wheels through a TorqShift 6-speed automatic transmission. If you're looking to use alternative fuels, the 6.2-litre gasoline-powered V-8 engine works with an optional CNG/Propane Gaseous Engine Prep Package. It prepares the engine to run on either compressed natural gas (CNG) or liquefied propane gas, in addition to gasoline. A truck should be about more than just power and durability. That's why Ford applies advanced technologies to help you be more productive. For example, the adaptive steering system works automatically, adjusting the steering ratio according to vehicle speed. Other examples include factory-installed auxiliary upfitter switches, a tailgate camera and a surround-view 360-degree camera system. See the Ford F-350 in action for yourself by visiting our dealership. Schedule a ﻿Test Drive Today!